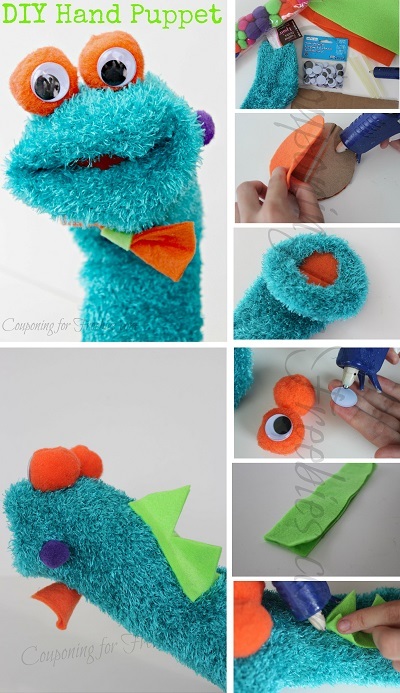 DIY Hand Puppet Cute And Easy To Make! « Hanes ComfortBlend ComfortFlex Fit Pullover Bra 2-Pack $5.40 + FREE Shipping! Do your kids like to play with puppets? How about to make their own puppet? 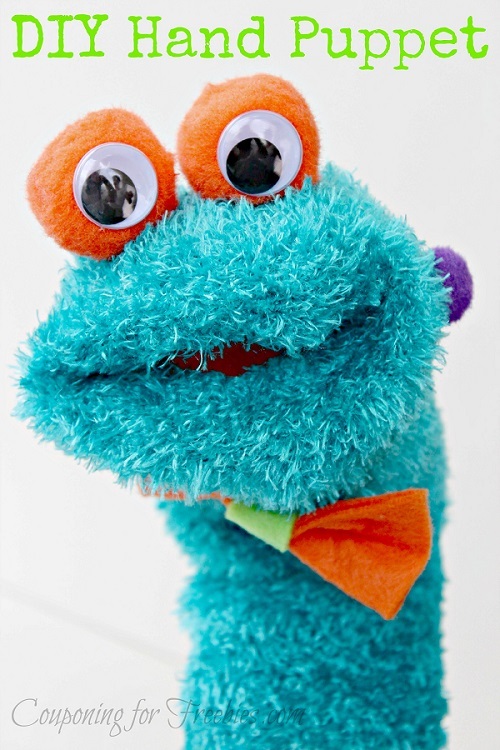 Well I have come up with what I think is a cute hand puppet and it is easy to make! You should already have most of the items in the house but it not they all can be found at the dollar store. That makes this not only easy and fun to make, but cheap too!! Cut a small piece of cardboard into circle that will fit the end of your sock. I fine it helps to trace a line like around a glass or cup to make the shape. Then fold that circle cardboard in half. Then trace the circle twice onto your piece of felt, cut out, and glue to both sides of the cardboard. Cut the end of the sock that is for the toes off. Now take the sock (the end you just cut), roll the edges around the felt covered cardboard. Use hot glue to hold the sock in place to make your mouth. Now using the hot glue, attach googly eyes to 2 pom pom balls and glue above mouth for eyes. To give it back bumps, cut two long strips of felt and hot glue it together length wise, so that half of it together and half has two flaps. Separate flaps and hot glue to back of the sock. You can cut triangle shapes out if you want it to look like spikes. You can decorate as you wish! Ours in the picture, we added extra pom pom balls and a felt bow tie.